Our day began with an early rain so intense it sounded like hail bouncing off the metal roof. While it might not wake the dead, its tattoo brought the Silver Fox and I to the table at an early hour. We lit the fire and shared a pot of coffee as the house warmed to the new day. We lazed a bit and then readied for what we thought the day might bring. Our plans had no contingency for precipitation that would not stop. Oregon winter rains, while heavy, are rarely constant and cloud breaks make it possible for the swift of foot to get out for at least short periods of time. There were no cloud breaks today and the rains were heavy enough to maroon us on our hillside for the day. We read a bit and then both gravitated to the kitchen. Bob rolled up his sleeves and started on a soup he had been wanting to try, and I, by consensus, went to work on an old-fashioned gingerbread we have both come to treasure. Gingerbread regularly appeared on the tables of our childhood and, for both of us, it is a food that evokes memories of warmth and comfort and a world forever young. Strangely enough, the recipe I use these days has replaced the one that came from Bob's family kitchen. The interloper was developed by Lynne Rossetto Kasper for The Splendid Table and I must tell you that for a new-fashioned recipe it makes the best old-fashioned gingerbread I've ever tasted. It is moist and dark and barely sweet but brimming with old-world flavor. 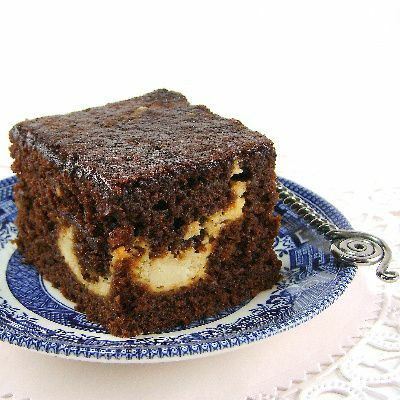 The depth of its flavor can be controlled by the type of molasses and brown sugar you use to make the cake. The cheese pockets in the gingerbread are something I don't normally include, but I used them today to add a bit of contrast for the photo. I honestly don't think they add much taste to the finished cake, but they don't harm it either. Gingerbread was loved by our European ancestors for what they believed were its medicinal values. They considered it to be a cure-all for a range of ailments and, in dried and crushed form, used it as baby food for colicky infants. Ginger is known to settle upset stomachs, so they may not have been too far off base. I serve it because we love its taste and knee-bending aroma. Only bread has more allure as it bakes. I like to serve this warm with lemon sauce or maple whipped cream. The cake is very easy to make and you can have it oven ready in about 15 minutes. I do hope you'll try this. Here's the recipe. 1) To make the cheese mixture: Beat cream cheese until light and smooth. Add egg, sugar, lemon juice and vanilla and beat until well-blended. Set aside. 2) Butter an 8-inch square pan. Fit bottom with parchment paper. Butter paper and flour pan. Set aside. Preheat oven to 350 degrees F.
3) Whisk flour, baking soda, salt and spices together in a medium bowl. Set aside. 4) In a large mixing bowl, beat together butter, molasses, hot water and brown sugar. When the mixture is almost frothy, beat in egg and gradually add flour mixture. Stir just until blended. 5) Pour half of batter into pan. Drop spoonfuls of filling over batter and pour remaining batter over top of filling. 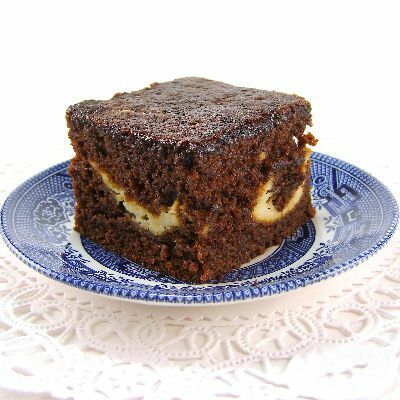 Bake 35 to 40 minutes, or until a tester inserted in center of cake comes out clean. Cool on a rack in pan for a moist cake. For a drier consistency, cool 10 minutes, then turn out of pan and set on rack to cool. Yield: 9 servings.